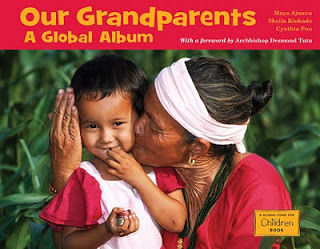 I first read the book Our Grandparents: A Global Album to my youngest son when he was two. He was enthralled and in awe. He paused and stared at each picture and asked “Where are they from, mama?” and made sure I showed him on the map. I was thrilled. We live in a rather homogenous community. I picked up this book thinking that it was a perfect way to introduce my young son to the rest of the world. Grandparents are a topic he can relate to and the pictures were intriguing enough to catch his attention. He inspected each picture with a sort of confused excitement. The book shows pictures of children together with their grandparents. Each picture represents a different culture around the world and shows love between the family members. What I love so much about this book is how simply and succinctly it gives the message that all people around the world are both the same and different. Look! People have different bodies and dress differently and live in different kinds of houses and eat different kinds of foods. But Hey! Everyone has grandparents! And grandparents love their grandchildren all over the world! That is exactly the understanding that I want to give to my son about the world.